Be the first to share your favorite memory, photo or story of J.D.. This memorial page is dedicated for family, friends and future generations to celebrate the life of their loved one. J.D. "Black Stallion" Hacker, 85, of Bear Branch, KY, passed away Wednesday, April 10th, at the University Of Kentucky Medical Center. J.D. was born in Manchester, KY on July 26, 1933, a son of the late Emma (Swafford) and Pearl Hacker. 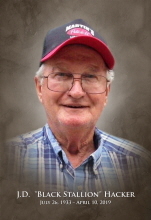 He was a lifelong trucker and a member of the Horse Creek Holiness Church. J.D. is survived by his wife of 63 years, Mary (Crawford) Hacker; his two daughters:Virginia Sis Hoskins and husband Wade, and Debra Ann Fisher and husband Todd; and his two sons: Gary Hacker and wife Diana, and James Ray Hacker and wife Deborah. He is also survived by his four sisters: Ethel Hibbard and husband Roger, Irene Deaton and husband Jennings, Geneva Jones and Rosetta Napier; his two brothers: Chris Hacker and Ralph Hacker; his sister in law Annie Hacker;his grandchildren: Elizabeth Fultz, Jonathan Hacker, Christopher Hacker, Elisha Hacker, Kayla Hoskins, Bobby Hoskins, Jacob Fisher and Abigail Fisher; his great grandchildren: Kylie Marie, Heavenly, Lindsey, Megan, Kyley Grace, Dalania, Kendra, Maci, Matthew, Jayden, J.D, Stella-Jhade and Ava; and by his faithful companion, Pee-wee. In addition to his parents, J.D. was preceded in death by his great grandson, Jaython Hacker; his brothers: Jack Hacker and Cecil Hacker; his sisters: Mary Grubbs and Hazel Sizemore. Services will be held at 2:00 PM on Sunday, April 14th at Britton Funeral Home in Manchester, KY with Terry Reed, Jonathan Sizemore, Bobby Buck Fultz, Jacob Fisher, and Wade England officiating. Burial will follow at the Manchester Memorial Gardens. To send flowers or a remembrance gift to the family of J.D. "Black Stallion" Hacker, please visit our Tribute Store. "Email Address" would like to share the life celebration of J.D. "Black Stallion" Hacker. Click on the "link" to go to share a favorite memory or leave a condolence message for the family.